A couple years ago, I got really interested in my family tree and history. I started working on creating my family tree and quickly realized how difficult it is. Certain sites, like ancestry.com, are very helpful to getting started. I have been using ancestry.com for a while now and I have always been happy with the service. Even though I was using that site, I was still having a hard time adding to my tree. The commercial made it look easy to type in a name and get the whole tree, but it takes quite a lot of time and effort. 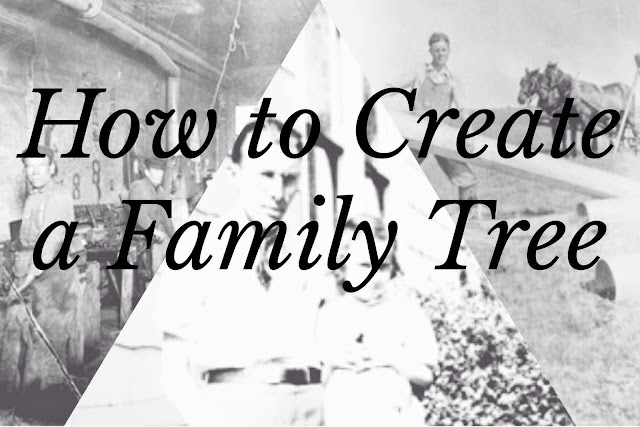 I can up with a few helpful hints that I use to successfully add to my family tree. 1. Sign up with ancestry.com. There is a fee with most services on this site, but you can try it out for free. I have learned so much about my lineage from this site. If you are serious about discover your family history, sign up for their program. 2. Create a work space. Find a desk or table to work at for a few hours where you can spread out and search for family history. Usually when I work on my tree, I sit at the kitchen table with my laptop, iPad, and a pad of paper. It's extremely helpful to have an addition screen or tablet near by to work with ancestry.com. I open up a file (a census, photo, document, etc.) on one screen and edit the tree on the other. It's a lot easier that flipping back and forth. The app is easier to edit the tree, so I use my laptop to open documents. I always use paper to quickly jot down notes on dates and people I want to add to my tree. Another great tool to have handy is a family member who knows more about the family. I try to work on my tree when my mom is around to help confirm facts and people. And that leads me to tip number two. 3. Double check your facts! Make sure you double check the information you enter into your tree. Check old family photos, obituaries, documents, etc. to make sure what you type in is correct. Putting in the wrong birth or death date for a family member can take you very far off track. Check with other family members if you are confused on a person in your tree. It's better to double check than spend a long time entering in data that isn't correct. 4. Remember to follow your lineage. Many of the people in my tree had parents that died young. Most of the parents would remarry and the new parent would adopt the children. Depending on the history you are looking for, this can make it difficult to track your lineage. It can be really cool learning about the adoptive parents (and I definitely include in my history), but a true family tree is done by following genetic parents. Quite a few times in my tree, this has lead to a dead end. I also like learning about the people that raised my family members, so I search for that information as well. Just remember what you're searching for and keep track of birth parents and adoptive ones. 5. Only use maiden names for women. When entering in women to your family tree, always use their maiden names. Using a married name can lead you to information on another women born to that name. It can look confusing seeing your tree filled with names you don't recognize, but it is the best way to find the right woman. If you don't know the maiden name, don't enter one. Ancestry.com is good at piecing together all the information entered to track down the right person. Entering the "wrong" name can lead to them finding a different person. 6. Don't accept every leaf that pops up! This is by far the most important rule to correctly adding to a family tree on ancestry.com. Check every single document. Look at every photo. Read every story. And compare each of the public member tree hints. Clicking and accepting every leaf will mess up your tree! One document with a different spelling can complete change your tree and the hints you will receive. Just read and confirm it is correct before you add anything to your tree. It not only affects your tree, but can cause other members trees to be incorrect. One of the hints Ancestry offers is public member tree connections. If multiple people have the same person in their tree, you can compare and add their facts to your tree. If everyone is clicking every document, everyone ends up with the wrong information. It is easy to see who has been clicking every document, so I tend to avoid public member tree connections. It is okay to ignore hints. I ignore about half the leaves that show up. If you ignore a hint, it saves it in the ignored file. If you find out it was correct, you can go back and add it to your tree. If you don't know if it is right, don't add it! Building a family tree is such an amazing way to learn about where you came from. I've seen so many pictures and documents that I would never have seen before thanks to ancestry.com and the members that upload their stories.If you have any questions or found something cool from ancestry.com, let me know! I love learning about family history, even if it's not mine. Next Post almost time to go.